VectorWorks has been one of the premiere CAD (computer-aided design) programs for the Macintosh for many years. Combining a powerful 2-D drafting environment with integrated 3-D modeling functionality, VectorWorks can take your project from planning to simple drafting to complex, photorealistic rendering. VectorWorks 2008 improves on and expands this already impressive array of capabilities. VectorWorks comprises six modules aimed at specific types of professional users. The slate of professionally targeted modules in the latest version is the same as in years past, but for each module, numerous enhancements make the program more user-friendly and powerful. VectorWorks Fundamentals includes most of the program’s core 2-D and 3-D CAD functions, but leaves out advanced rendering capabilities as well as many profession-specific features. VectorWorks Architect, aimed at architects and similar design professionals, has loads of specialized tools such as space planning, door, wall, and window tools. VectorWorks Landmark is designed for landscape architecture and planning. VectorWorks Spotlight targets the entertainment industry, including theater, event planning, and exhibition. VectorWorks Machine Design is aimed at mechanical engineers. RenderWorks, a high-end rendering module, can be added to and used with any VectorWorks module. VectorWorks Designer combines all of the modules into one huge package. A VectorWorks screen showing three externally referenced files. Most of the interface improvements in VectorWorks 2008 apply to all of the modules. That’s in addition to a slew of new features for selected versions. We’ll concentrate mainly on major new features that apply to all or most of the modules. In a wide-reaching interface overhaul, VectorWorks 2008 debuts a new floating data bar (also known as a heads-up display) that shows the dimensions and angles of your drawing in a floating display that moves with your cursor. This allows you to focus on your drawing without having to refer back to a palette or display on another part of the interface. You can configure the floating data bar so that it’s visible all of the time, none of the time, or only when you call for it, and it can provide various levels of basic or detailed information. Non-rendered 2-D and 3-D elements in VectorWorks 2008 are no longer limited to the Mac’s system colors (or my favorite technique: mixing colors using the foregrounds and backgrounds in fill patterns). You can now choose from an unlimited number of colors. In addition, VectorWorks 2008 includes color swatches from Pantone, Benjamin Moore, Sherwin-Williams, and other paint vendors, which is convenient for architects and a big improvement over the previous versions when it comes to producing presentation drawings. This new version also gives you full control over opacity on an object-by-object basis. This allows for varying degrees of transparency for your drawing objects, which is very handy for presentations. If your version of VectorWorks includes RenderWorks, you’ll find that improved bump shaders (which simulate textures) give a more realistic effect to textured surfaces. VectorWorks 2008 adds import and export capabilities for the popular AutoCAD format—the industry standard—through the 2007/2008 formats. Nemetschek is doing a good job of keeping VectorWorks updated to work with the latest versions of AutoCAD. VectorWorks 2008 also has a new file format, so opening an existing file in 2008 will prompt you to save a new version in the new format. Export functions let you go back to VectorWorks versions 12, 11, and 10, if necessary. All versions of VectorWorks 2008 except for Fundamentals simply and elegantly solve the problem of drawing areas or sections of your plans that are set at different angles from each other—for a house with a wing set at 60 degrees to the rest of the layout, for instance. When you want to work on parts of your drawing located in these different areas, you can temporarily rotate your plan and continue to draw at 0 and 90 degrees relative to your view on the screen. You can rotate your plan back to your original view at any time. VectorWorks 2008 has made workgroup management much easier by allowing you to manage content, resources, and preferences in external custom folders where managers can control where object libraries, symbols, details, textures, and hatches are stored, and who has access to them. This makes it easier to upgrade or add CAD stations to your office. Also, once a project is underway, the additional resources such as symbols and library objects that are inevitably created specifically for that project are initially stored only in the specific project file. VectorWorks 2008 makes it easier to export these project resources back to the standard office-wide library file where all workgroup members will have access to them. Viewports is a page-layout feature that lets you create sheets showing multiple views of the same model or drawing. Each view can have an independent scale, orientation, rendering, layer, and class visibility setting. These views are automatically updated when you change the master drawing. You can add notes and dimensions to viewports and they can display information at different scales, making them a good way to show details or close-ups of your project. All versions of VectorWorks 2008 except Fundamentals expand on viewports by allowing them to reference external VectorWorks files and images so you can display them from within your drawing. The referenced files remain separate; they’re not imported into your drawing and therefore do not increase the size of your file. Allowing viewports to display external files is very important for mid-size and large offices where various people are working on the same project. Different people can work on referenced files individually while the master file can be updated at any time incorporating the entire workgroup’s progress. This feature is also useful for any office that is using standard details, product spec sheets, schedules, or documents provided by team members from remote locations. Referenced files can be VectorWorks files, PDF files, or image files in formats such as PSD, JPEG, or GIF. VectorWorks’ interface for viewports has always been a bit confusing, but in the 2008 version, it has been streamlined; getting in and out of the feature is easier, and there are other useful additions as well, such as the ability to create associative dimensions (so that when an object is changed, its dimensions automatically change) and flipped text. VectorWorks viewports are still complex, but the improvements in 2008 are a step in the right direction. An improvement I would like to see is the ability to have multiple viewports referencing external files on the same layer, even if they are of different scales. Currently, if I am assembling a page of details made up of viewports, I’d need to create a separate layer for each detail that has a different scale. New for 2008 (again, in all versions except Fundamentals) is a feature called Two Way worksheets, which lets you edit an attribute within a spreadsheet so that it is reflected in the actual model. Worksheets—something VectorWorks has had for years—are basically spreadsheets that are linked to the CAD drawings and can perform calculations as well as return and display information about a model, including areas, dimensions, and specific types of objects or symbols. Architects, for instance, might use worksheets to create window or door schedules where the total number of each kind of door is displayed with a key number, dimensions, and a manufacturer. This great new feature syncs your drawings and other project information in real time. If you’re working with the Architect, Landmark, Spotlight, or Designer modules, a new modeling capability enables you to edit wall components in 3-D. Prior to 2008, wall components had to be edited in the 2-D Plan view. Now, from within any 3-D view, such as the Isometric view, you can create, move, join, and edit walls. The VectorWorks interface gives you visual clues while you draw to help ensure that your wall is placed where you want it. You can also place and edit symbols and objects such as doors and windows from within any 3-D view. There’s also an expanded object library that includes a Herman Miller Furniture library, an updated Marvin Windows and Doors library, and a new Sub-Zero and Wolf appliance library. VectorWorks Landmark users get an improved Plant tool that treats plant objects more like VectorWorks symbol objects and offers more control over individual plant attributes. They’ll also have an easier time importing plants from other projects and editing both 2-D and 3-D views of plant objects. Another nice addition for Landmark is a plant database of over 1,000 plants, including characteristics, colors, uses, and growing zones. The database is a separate file that can be launched from within Landmark, but it also runs as a standalone FileMaker Pro database (FileMaker is not required) and can access the Web automatically to call up images of the plants in the database. You can also transfer data from the plant database to your VectorWorks file, which aids in placing selected plants. This integration is currently about a six-step process in Landmark. I would like to be able to select a corresponding symbol object right from the database and start using it in VectorWorks with proper records automatically filled in from the database. The Landmark version has been able to import shape files (.shp)—used for mapping and planning—for some time. Landmark 2008 adds support for geo-referenced image files—raster files (such as GIF or JPEG) that have an associated World file. The World file stores scale, location, and rotation information about the image file. By importing geo-referenced image files, Landmark can now automatically align these images over shape files. For instance, you can now import aerial photography (if available as geo-reference images) on to your plan and have the images automatically scaled and aligned with each other and the underlying plan. Spotlight 2008 adds advanced beam geometry, including elliptical light sources and support for shutter cuts in both wireframe and rendered modes. You can also control the light source in a lighting instrument with the Visualization palette, accessing the brightness, spread, color, and fall. Considering only the improvements common to all of the VectorWorks 2008 modules (that are available in Fundamentals), this new version is extensive and its additions significant. I wish the Rotate Page and Design Layer Viewports (for referencing external files) were also part of the Fundamentals package. If you’re in a profession specifically targeted by one of VectorWorks’ design programs—Architect, Spotlight, Landmark, or Machine Design—VectorWorks 2008 is a great CAD program that provides a great value for the price. 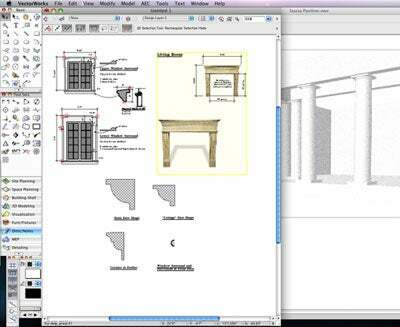 If you just want a basic CAD program for drafting, VectorWorks 2008 Fundamentals can handle that with ease. But there are less expensive alternatives for basic drafting. With VectorWorks, you will want to leverage 3-D modeling, rendering, and workflow tools. I recommend taking advantage of the free training videos on the Nemetschek Web site, and even the more advanced training CDs available online.